Onkyo TX-SR608 review | What Hi-Fi? Our recent First Test of the Onkyo TX-SR608 was as insightful as you'd expect, but it boiled down to this: Onkyo's back with a bang. And with the receiver market being what it is, the TX-SR608 hasn't had time to arrange its laurels, let alone rest on them, before it's tossed into the Group Test fray. Even when lined up against price-comparable rivals from the biggest hitters around, the Onkyo still leads the specification race – its lantern-jawed box is bursting at the seams. All six HDMI inputs are compatible with 3D content and displays, there's audio return to turn your receiver-to-TV HDMI connection into a two-way street, and the Onkyo converts and scales from any video input up to HDMI/1080p. It's ready to drive nine speakers plus a couple of subwooofers if you're really ambitious, and it's THX Select2 Plus certified too. Add a raft of extra connectivity, delightfully clear menus, rapid mic-assisted set-up and a remote control that's easily negotiated and the TX-SR608 doesn't miss a trick. Green Zone's DTS-HD Master Audio soundtrack is a rugged, occasionally muddy test of control, and the Onkyo handles it impressively. It creates a wide soundstage that extends well beyond the confines of the room, and has the by-no-means common knack of integrating each channel into a coherent whole while still making every individual thread easy to follow. Disciplined, poised and able to retrieve the finest of details, the TX-SR608 is a long way removed from the angry bluster of some previous Onkyo receivers. Although it's far from the most forceful we've heard, it can still pin you to your seat; the iron fist wears a velvet glove. Dialogue is distinct, the bottom end's meaningfully weighty and the top attacks crisply. Effects are steered excitingly and sited securely, and there's a refinement to the Onkyo's presentation that makes long listening sessions fly by. Converting and scaling a DVD of REM's This Film Is On to HDMI and 1080p, the TX-SR608 is equally impressive. Pictures are clean and crisp (where they're not shot on Super8, of course), picture noise is at an absolute minimum and the Onkyo remains unflustered by even the most severe motion or complicated pattern. This refinement carries over intact, more or less, to the reproduction of stereo music. No one's expecting exemplary musicality from a sub-£500 multichannel receiver, naturally, but the TX-SR608 is a determinedly inoffensive music-maker and, when playing The Cure's A Forest, demonstrates assured focus and staging as well as genuinely unexpected detail and articulacy. 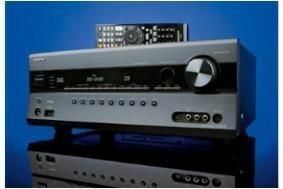 There are other receivers that muster greater attack and drive than this Onkyo, and if ‘pummelling' is an entirely positive word in your vocabulary you'd better check 'em out. But if it's widescreen, refined and beautifully balanced multichannel thrills you're after, the TX-SR608 is pretty much compelling.